<a-z – A ‘<’ character followed by an alpha character. <!, </, <? – A ‘<’ character followed by a special character. &,# – A special character. Generally application developers lack proper security training and are time-constrained. 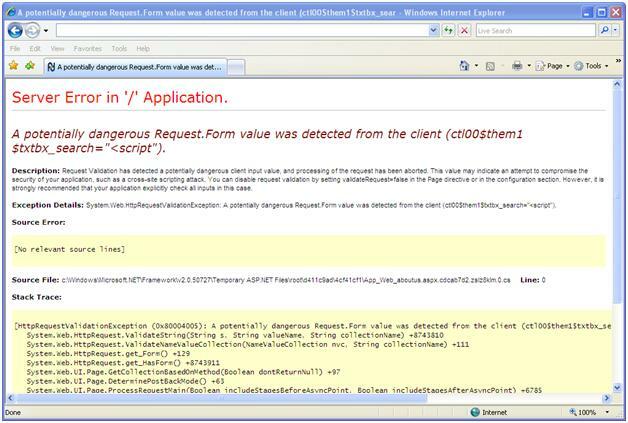 So they rely on ASP .NET in-built features to guard their applications. Automated application testing for HTML injection will likely be prevented by the ValidateRequest filters. This ultimately means that tests to ensure that applications have been written following secure programming guidelines can be invalidated. Result: The ValidateRequest filter blocks request if any alpha (a-z, A-Z) or certain special characters – i.e. exclamation mark (!) or dollar sign ($) – are supplied after a left angle bracket (<). 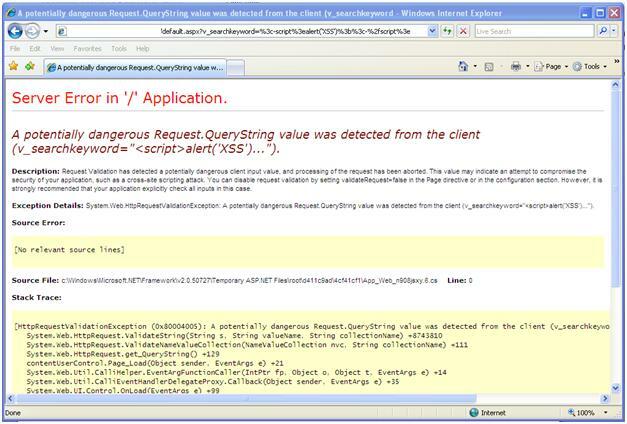 Test#2: Submit ‘<XSS STYLE=”xss:expression(alert(‘XSS’))”>’ as input in text field. 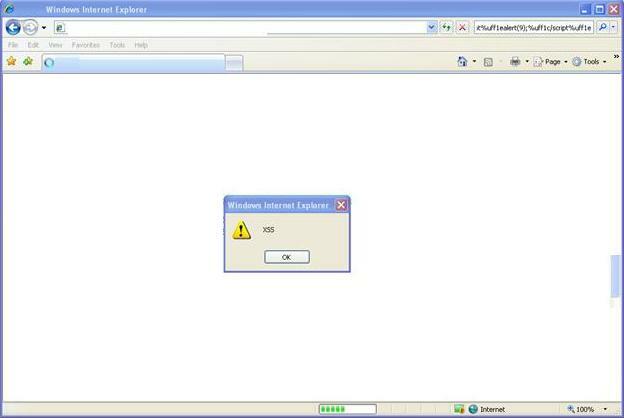 Again it generates a ‘potentially dangerous’ error message. 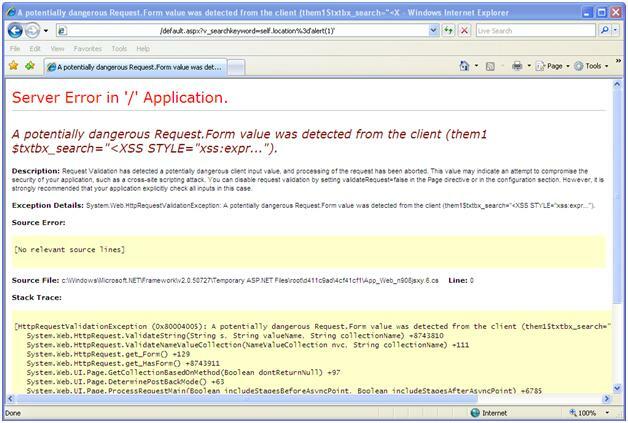 Result: The ValidateRequest filter blocks request on matching ‘<XSS STYLE=”xss:expression(alert(‘XSS’))”>’ string. Now submit ‘<-/’ as input in text box. This time the error page is not shown. It means that this type of payload can bypass the ValidateRequest filter. Result: The ValidateRequest filter blocks request on matching ‘</’ string but a string like ‘<-/’ can bypass the filter. Result: The ValidateRequest filter decodes the URL encoded payload and blocks request on matching ‘<a-z’ string. Result: The Unicode payload can bypass ValidateRequest filter. Solution: The above tests show the importance of output sanitization for preventing cross site scripting attacks. Although input validation is present, but can’t protect the application completely. 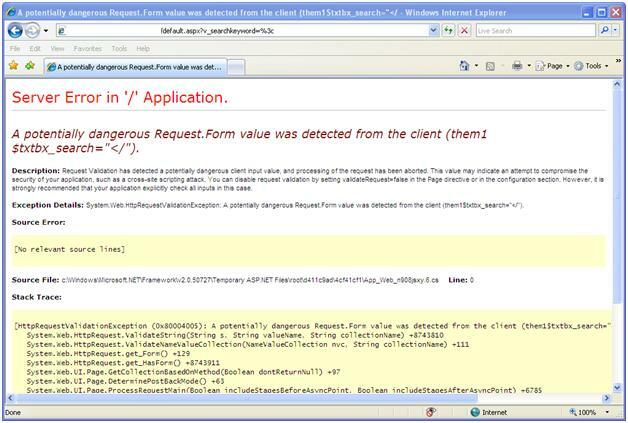 Microsoft discontinued with ValidateRequest filter in .NET framework version 4. 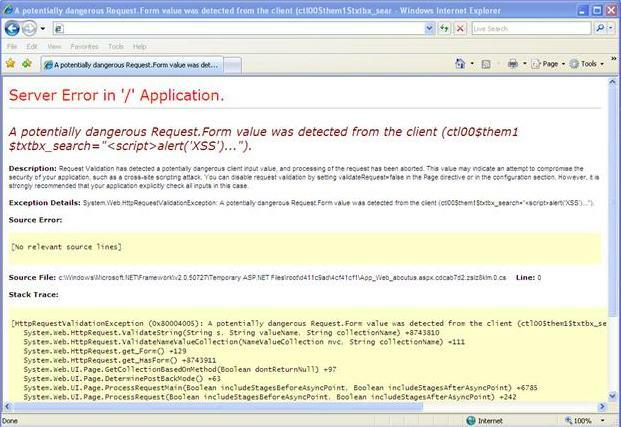 This entry was tagged Application Security, Cross Site Scripting (XSS), Unicode, VAlidateRequest. Bookmark the permalink. Gud one to understand easily, shows your effort in it as well. What is the replacement of ValidateRequest in version 4. Should the filter been continued or is it right to discontinue. Also would like to know, which would be the better way to pass db query : plain text or unicode? ValidateRequest is actually present in.NET framework 4 also but even if you try to activate the filter, it will not allow you to do so. To activate Validaterequest in .NET 4.0 you have to change ‘requestValidationMode’ value to 2.0 in web.config file. Would you please provide more details which kind of db query are you talking about? Are you talking about db queries in a thick client application with 2-tier architecture? This method will work if .NET grid control is used in the target application and can be used for stored XSS testing only.